How much does it cost to travel to Quebec City? How much money will you need in Quebec City? CA$122 ($91) is the average daily price for traveling in Quebec City. The average price of food for one day is CA$31 ($23). The average price of a hotel for a couple is CA$153 ($114). Additional pricing is in the table below. These average travel prices have been collected from other travelers to help you plan your own travel budget. How expensive is Quebec City? How much money do I need for Quebec City? Quebec City is the capital of the Quebec province. It has a dramatic location on the cliffs by St. Lawrence Seaway and the city's Old Town has been declared a UNESCO World Heritage Site. Quebec is a mid sized city with a population of about 700,000. Most of the economy is administrative and bureaucratic, but the city has a very impressive history as the fortress capital of New France. French is the official language of the entire province, but most people in the tourist areas of Quebec City speak English. Quebec's climate is humid continental. There are four distinct seasons. Summers are warm with high humidity. Winters are cold, windy, and snowy with highs in the low 20s Fahrenheit. Snow is usually on the ground from December to April. Spring and Fall are both short and cool, with occasional warm days. The vast majority of the sights in Quebec City are located in the Old Town. There are many small boutique shops and historical buildings with interesting architecture in this area. In the Haute-Ville area you will find Chateau Frontenac, which is a beautiful, old hotel. Dufferin Terrace is the nearby boardwalk. Other sights in the area include Musee National des Beaux-arts du Quebec, Musee de l'Amerique francaise, Morrin Centre, Plains of Abraham Battlefield Park, and the Citadel. In Basse-ville, the main sights include Place-Royale, which is a beautiful public square, and Musee de la civilisation, which has an exhibit of Quebec's history. Petit Champlain is also in this area. It's a small neighborhood that is one of the oldest commerical districts in North America. The streets are lined with shops and cafes and its a great area to explore. Most of the sights of interest are in the Old Town, which is still surrounded by its original walls. Haute-Ville (Upper Town), and Basse-Ville (Lower Town) have a variety of neighborhoods worth visiting. These include Saint-Roch, Saint-Jean-Baptiste, Montcalm, Vieux-Port and Limoilou. Downtown Quebec City is just west of the Old Town. Levis is a town that is located on the other side of the St. Lawrence River. It can be reached by ferry. If you're looking for some interesting ways to see the city there are a handful of options for tourists. These include horse drawn carriages, cruises along the St. Lawrence River, and a handful of walking tours which are offered through a variety of tourist companies. Events in the city include the Winter Carnival, the Saint-Jean Baptiste Celebration, Festival d'ete, Edwin-Belanger Bandstand, the Festival of New France, and the Quebec City International Festival of Military Bands. Quebec City has excellent food. The cafe culture thrives here and it is easy to find a quaint cafe around Marche Champlain and around the Chateau. Food in the city can be quite expensive, even at informal cafes or markets. Cheaper options include a traditional tourtiere quebecoise, which is a meat pie, or a poutine, which is a traditional Canadian dish of fries covered in gravy and cheese curds. If you want to fully embrace the dining experience, many restaurants offer table d'hote specials, which are full course, fixed price meals. Most restaurants in the Old Town have menus in both French and English. If you want to prepare your own meal or enjoy a light picnic, then there are many markets around town that sell a variety of local cheeses. Specialties include brie and camembert style cheeses. The easiest way to explore Quebec City is on foot. The Old Town is quite compact with many cobblestone streets. You can also head into the nearby neighborhoods, some of which are connected by staircases. 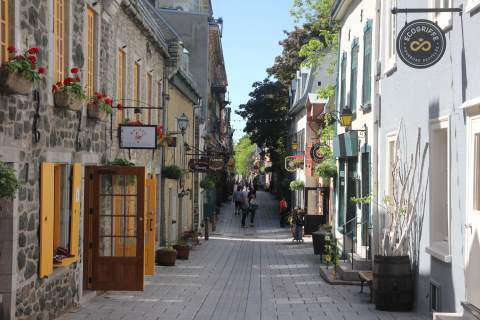 You really want to spend as much time as possible wandering on foot through Quebec City as this is the best way to experience the atmosphere and culture of the city. Driving in the Old Town can be challenging because of the narrow, cobblestoned streets, many of which are one way. Parking is also difficult to find and parking regulations are strictly enforced. In the areas outside of Old Town it is helpful to have a car. If you don't have a car and plan to venture further than the nearby neighborhoods, there is a decent bus system that is efficient and easy to understand. There is also a ferry from Quebec to Levis that takes about 15 minutes and runs year around.